I connected with Rezel because she had ordered some Golden Fuel, but little did I know at the time how talented of a recipe developer and food photographer she is! Her blog is full of innovative recipes that are not actually hard to make for how beautiful and "fancy" they may seem from the beautiful photos. Then she made these stunning Golden Fuel Tarts that just floored us. 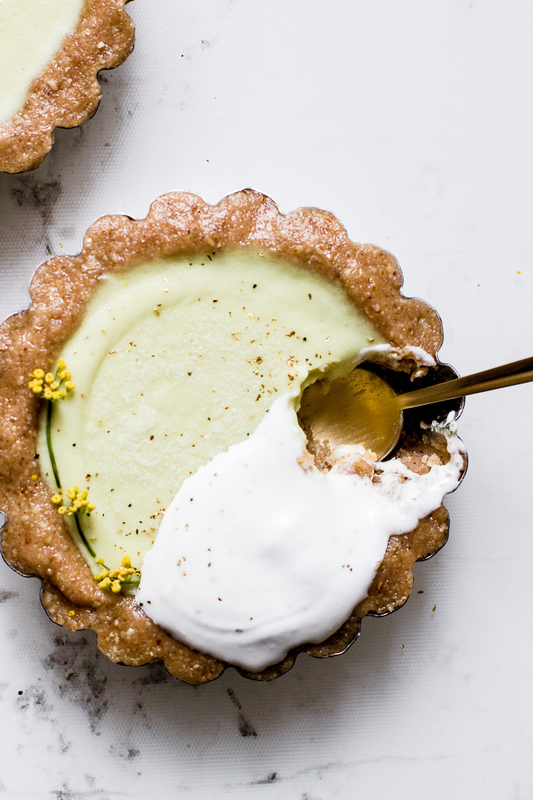 Not only are they just beautiful to begin with, but these tarts use coconut cream and healthy nuts to make them gluten-free, dairy-free, and NO BAKE. They take very little actual "cooking," and if you've ever made fat balls or used a food processor, you can most definitely make these. These are also super easy to prep in advance for a gathering, as they can just hang out in the freezer. She was generous enough to share her gorgeous photos (all photos are by her in this post!) and her recipe with us here. Let's get to it! 1. Place all the ingredients for the crust in a food processor and blend until you start getting moist crumbs. You should be able to pinch the dough and it holds together. 2. Coat 6 mini tart pans with a loose bottom with coconut oil. Turn out the dough into the tart pans and press into an even layer all over the bottom and up the sides. Repeat for all the tart pans. 3. Place in the freezer while you make the golden fuel filling. 1. Place the coconut cream in a small sauce pan on low-medium heat and with a whisk stir until the lumps are gone. Once the lumps are gone turn off the heat and in a small cup dissolve the golden fuel in the hot water then add into the coconut cream and add in the date or cassava syrup. Mix until all ingredients are fully incorporated and add in the arrowroot flour. Turn on the heat back to low-medium and keep stirring with a whisk until the filling has thickened. It will take about 10 minutes to get to the right consistency. Turn of the heat and let the filling cool to room temperature. 1. To make the coco whip place the coconut cream in a small bowl and use a whisk to whip until it’s light and frothy. Put back in the refrigerator until ready to use. 1. Take out the tarts lined with the nut crust from the freezer and equally pour in the filling into each tart. Place back in the freezer until the filling has set. This will take about an hour. 2. Take the tarts out the the freezer and carefully take out of the tins. You can heat up some water and place a dish cloth it in and wrap the bottoms of the tarts to loosen it. 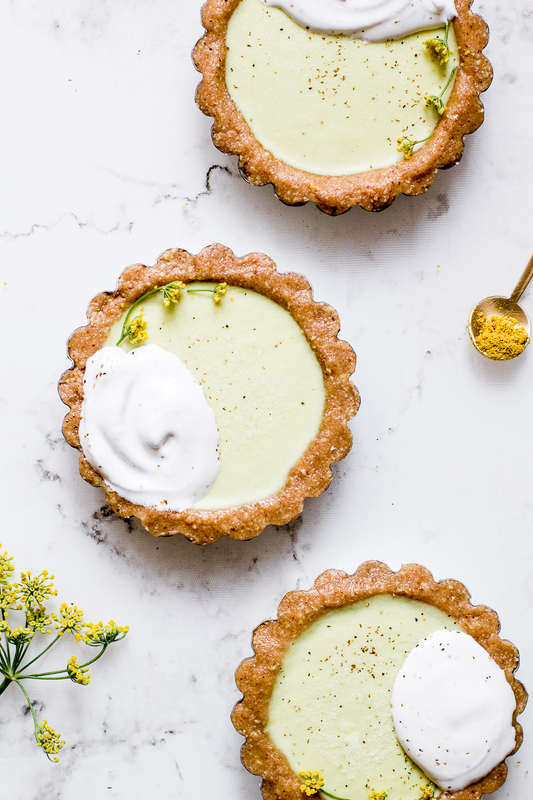 Place the tarts on a serving dish and garnish with a spoon of coco whip and then sprinkle some black pepper, dill flowers and gold flakes on top. Live 24k now at Free People!